Types of servers in a computer network are highly different by purpose and by properties. A computer server may be a physical server, i.e. a machine, or belong to some of virtual server types (Hyper-V, VMware etc.). 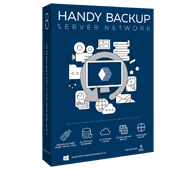 Handy Backup supports backup and recovery for all Windows server types. These servers are separate computer units or even clusters, equipped with their own hardware and external devices. Such types of server in a computer network provide a mainframe for communications, data storage and processing big arrays of information (see below). This definition can contain some disambiguation. A virtual server means either a server-type OS running on a virtual machine of some type (for cloud computing, software testing or other purposes), or a physical device dedicated to run many virtual machines (a virtual machine array). Note: Here, we are using the first definition of a virtual server (a virtual machine with server-type purposes and OS). We are considering the second type as physical servers for virtual machines. Backup Software from Novosoft LLC. 299 USD per license. The Server Network is a network-oriented solution for complex infrastructure, which allows taking backups from different Linux and Windows server types in a network from a central console. File server: designed for storing user files and folders in a network (including backup files). Application server: provides client access to some network-oriented application (i.e. an IDE). Domain server: supports a logical domain (e.g. for websites) in a network. Database server: a type of application server, operating with a network-oriented DBMS. Communication server: provides communicative technologies such as email, firewall or VoIP. Print server: allows printing files through a network. These are the subsections behind this main classification. For example, modern server storage types include NAS/SAN units (network drives), FTP/SFTP/FTPS file storages and cloud services. Virtual server types for databases are including bundle solutions for almost each DBMS even existed. …and Why All These Types Have a Need for Backup? All types of server solutions are prone to network perils, such as hacking, theft, hardware malfunctions, viruses and ransomware. For big server-oriented projects, these perils can cause a loss of many millions of dollars, and the fastest way to protect you from a disaster is to take a regular remote server backup. An advice: Do not rely on server backup scripts to make such important actions as complete or partial protection of your virtual or physical server data! Instead, utilize some dedicated server backup software (such as Handy Backup) to protect your server information. Plug-ins for “hot” backup of popular virtual server types including Hyper-V, VMware. Backup plug-ins for data of all Windows server types: databases, websites, disk images. Automated jobs with scheduling by time and by system events. Built-in partition backup, time stamping, compression and encryption. Other functions such as running external software along with a task, Linux backup etc. Try Handy Backup to take snapshots for all Windows server types, virtual and physical, as well as for Linux servers! Download a trial edition with all functions and plug-ins for a 30-day free trial period!